Void Star opens by establishing a future of incrementally better technology marred by rising sea levels and a nearly unbridgeable chasm between the rich and the poor. Whereas the very wealthy live in protected enclaves and enjoy medical treatments that permit lifespans of well over a century, the poor live in concrete warrens with no law and little hope. There is another divide in this future, however: a divide between humanity and its increasingly indispensable artificial intelligences. AIs in Void Star possess a very different sort of intelligence from that of humans; they are very capable in their own way but not self-aware and unable therefore to communicate directly with their human masters. Our first window into this world is Irina, a “computational translator” who consults with companies as a sort of AI whisperer. Irina has a nearly unique ability to bridge the human/digital divide and understand what an AI is thinking thanks to a neural implant that connects her mind with a computer. Although many other genre stories imagine such implants becoming ubiquitous, in Void Star they are proving to be a technological dead end. The dangers of altering the human mind are too great, so implants are only used in cases when a person would otherwise die. Another viewpoint character, Thales, is experiencing the dark side of these implants. The son of a powerful Brazilian politician, Thales receives an implant after an assassination attempt nearly kills him. He goes to a clinic nearly every day for therapy and tuning, yet for some reason he can’t seem to adjust and lives an increasingly fragmentary existence. The last character, Kern, is an orphan from the slums whose single-minded athletic training has made him a fearsome street fighter. Kern has no implant and so must rely on more primitive interfaces. As a child, he stumbles across an abandoned laptop with educational software that is intended to bootstrap someone like him from nothing into being a productive member of the first world. Kern learns literacy and English from the laptop’s software, martial arts from its electronic books, and a sense of honor from its collection of samurai movies, but in a world without opportunities he is simply an unusually capable thug. Everything changes for Kern when he’s hired to steal a cell phone and, after doing so, decides to answer it when it rings. The cell phone is itself a kind of interface from Kern’s inescapable poverty to the world of the rich. The woman on the other end, though she says she is stuck in house arrest, can effortlessly command resources that Kern can only dream about, and in exchange for his help with tasks that may eventually free her, he finds himself lifted out of the slums and into the hotels and malls of the rich. There’s more to this than meets the eye, of course, something the reader knows because of a link between Kern's cell phone and an AI that Irina has been hired to investigate for an extremely old and wealthy tech billionaire. Meanwhile, secret recordings of conversations involving Irina and her billionaire client are being used in Thales’ therapy sessions, something he only slowly manages to question amid his struggles with gaps in his memory. Although science fiction usually defaults to AIs that can easily relate to the world in more or less the way that people do, there is a lot of technical merit in the idea that even AI far more sophisticated than what we have today might nevertheless be alien and inscrutable. Even though neural networks operate on some of the same principles as human brains, they are evolved around the contours of specific tasks and don't have our built-in capabilities for general-purpose reasoning and language. Void Star’s author, Zachary Mason, has a PhD in artificial intelligence research, so he must know this better than almost anyone. There’s real beauty to the prose at times, but this effort to impart the feeling of the story necessarily comes at the cost of immediacy. Perhaps in recognition of this danger, Mason has broken up the story into very short chapters, usually switching viewpoints at each break. This helps to give a feeling of motion to a story that, in truth, often moves slowly. It would be easy to make fun of this, especially the last line. Irina works intuitively using sensations from her unique neural implant, so perhaps it's true that language shouldn't suffice for her, but language is the book's only medium of communication with us, the readers. Mason is obviously making an effort here, straining to convey what an AI is like even while he carefully avoids ever saying what it is. Whether or not a reader will find this satisfying depends on why they like reading science fiction. For those interested in learning how things work, Void Star will be a very frustrating experience. What are the filters filtering? She adjusts the intensity, but the intensity of what? Why are the AI’s thoughts represented by “glyphs”? The novel provides few if any answers to these types of questions. But many read SF in hopes of understanding what living in the future might feel like, and this is the audience Void Star is more likely to satisfy. That's not to say it’s entirely a mood piece. The plot starts slow but builds steadily as its three characters travel the world, slowly learn about the secret forces shaping their lives, and struggle through some violent encounters. The ending pulls together the story’s three narratives and brings everything to a reasonably satisfying conclusion. That alone is very much to the book's credit. Given the most unique element in the book was its unknowable AI, however, it’s a bit disappointing that the ending’s culminating clarity about what has happened requires the book to indulge in anthropomorphizing two different AIs and letting them communicate with human characters. Because of the novel’s focus on the experience of its characters, to a large degree it succeeds or fails on the strength of its depiction of its three viewpoint characters. Irina is the standout, a capable and active participant in the plot with an interesting and at times affecting backstory and emotional connections with other people. Thales is more of a sketch, spending too much time in a fog of neurological confusion to ever really come alive, but the book also spends the least time with him and there end up being good reasons for this. Kern, alas, is a disappointment. Irina is rich, albeit insecurely rich, and Thales is the scion of political elites, so Kern is our window into the life of the poor and the desperate. Yet Kern is both too weird and too normal. He’s too weird because his obsessive discipline in combat training and his unique software-provided education make him wholly unrepresentative of life in the slums. Yet he’s also too normal, because despite his bizarre background and the increasingly strange things that happen to him, he seems like a slightly naive but otherwise quite ordinary person. He never seems impacted either by the poverty of his childhood or by his detailed but very artificial education. It doesn't help that Kern's ultimate warrior status is a cliché in science fiction, a trope the book never tries to subvert. To put it another way, Kern feels like a Neal Stephenson character wandering around a William Gibson novel. 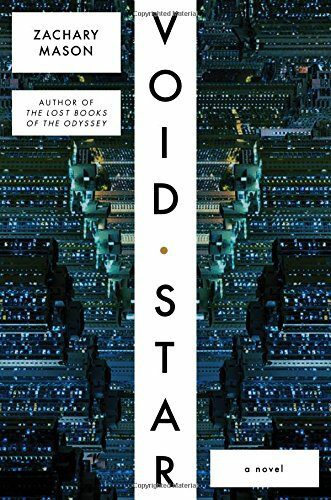 Gibson looms large as a major influence on this novel, to the point that Void Star feels like a modern Neuromancer. That is, of course, the sort of endorsement the publisher would probably like to put on the book, but it's both praise and criticism. Praise because the things Void Star does well are also things that Neuromancer did well: it conveys the feeling of a cybernetic future without drowning the reader in technical detail and it features interesting characters trying to make their way in a world dominated by corporations and AI. But it's a criticism, too, because much of what it does, Neuromancer already did. And one virtue it can't possibly have is the one that made Neuromancer so widely read at the time but often disappointing to many young readers who try to read it now: the shock of the new. Void Star is a pleasant riff on well-established cyberpunk themes, but hopefully in his future work Zachary Mason will use his obvious talent as a writer and his knowledge of computer science in service of a more ambitious story.